Burps, dribbles, baby spit-up. Life with a new bundle of joy can be messy. SwaddleDesigns 100% Cotton Baby Burpies are a stylish, functional and decorative solution to help moms and dads keep clean when feeding their baby. Set of two, both generously sized at 14 x 18 inches (36 x 46 cm) and come with an absorbent center panel. 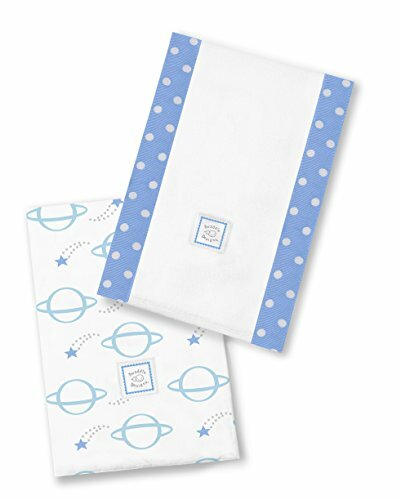 Our stylish burp cloths can also be used as a lap pad, changing pad, cover, or cushion. Coordinates with a variety of our quality baby essentials. Machine wash gentle. Set of 2 machine washable burp cloths with absorbent center panel. Each burp pad measures 14 x 18 inches (36 x 46 cm) when unfolded. Multi-purpose: on the shoulder, lap pad, changing table, and so much more! Coordinates with a variety of our quality baby essentials. If you have any questions about this product by SwaddleDesigns, contact us by completing and submitting the form below. If you are looking for a specif part number, please include it with your message.